Includes Mr Frosty spoons and bowls to taste your creations! Make your own delicious frozen treats with Mr Frosty the Ice Crunchy Maker, the coolest guy around! This friendly snowman comes with everything you need to create your own crunchy ice, fruity ice shapes and ice lollies! To make refreshing drinks, simply add some ice under Mr Frosty's hat and turn the handle to crush it. Then put the ice into one of the sundae dishes and use the squeezy penguin to add your favourite juice or cordial. You now have the perfect thing for a summer's day. You can also use the ice lolly moulds and shape trays for even more fruity creations. Simply pop your favourite fruity drinks into the moulds and place them in the freezer for a while, then take them out and they're ready to eat. For even more fun, put the frozen shapes under Mr Frosty's hat and turn the handle on his back to create tasty crushed ice treats for everyone. 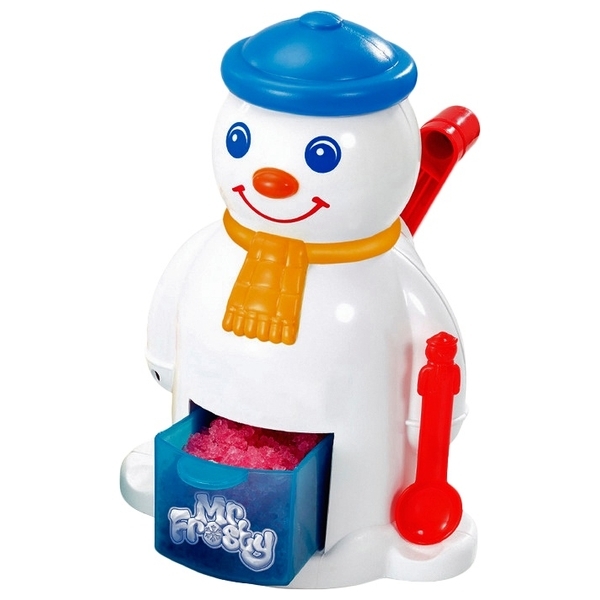 Spice up the ice with Mr Frosty the Ice Crunchy Maker!